Diane Bradshaw of Direct Communications presents a check for $500 to Tom Tillman, Principal of Hidden Hollow, and Reon Cowan, assistant. November 2013 -Eagle Mountain, Utah. 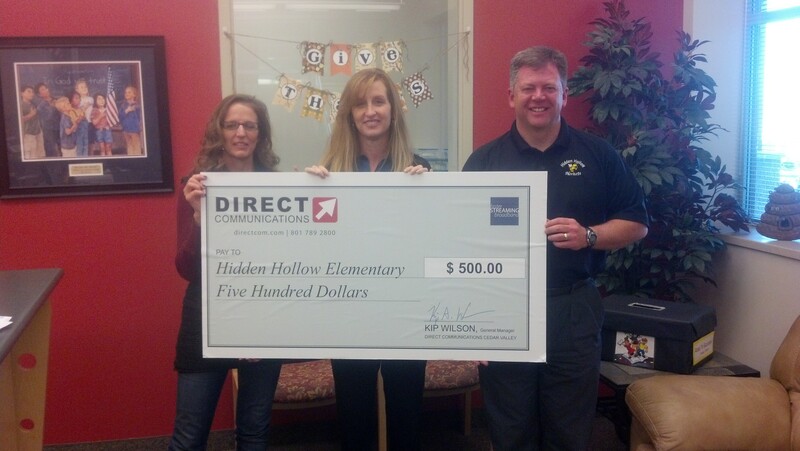 Direct Communications donated $500 to Hidden Hollow Elementary School, as part of their continuing effort to support education in Eagle Mountain. Hidden Hollow elementary is using the $500 donation from Direct Communications this year to buy snow shoes for their 5th graders, who will attend Clear Creek Camp in the spring. Brigham Griffin, Marketing Director for Direct Communications, has been with the company since 2005. Brigham has an MBA from the University of Utah, and a BA in Communications from Brigham Young University. He is a Professional in Residence at Utah Valley University, and also serves as an adjunct professor of marketing at Idaho State University. How do I set up my new e-bill account online? Are There Any Limitations To DSL Service? What Internet Speed Do I Need to Watch Netflix? Enter your email address to subscribe to Directcom's blog and receive notifications of new posts by email. PROTECT YOUR FAMILY BY SECURING YOUR HOME WIFI NETWORK. Directcom is Faster Streaming Broadband.